You were cleaning out the attic of your house when you found a strange closed box with complex mechanisms. You could hear a faint tapping coming from that box. Maybe not a good idea to try to open it, but that depends on you. 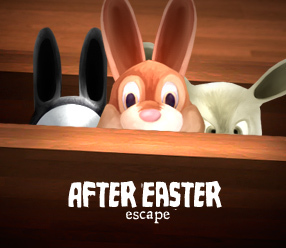 A little late but here you have the easter game I was creating new puzzles, some quite difficult, but not impossible. This entry was posted in Escape Games, Games, Our games, Room escape games and tagged adventure games, casual games, escape games, free online games, games, logic games, point and click games, puzzle games. Bookmark the permalink. WOW!! You’ve done it yet again with another most imaginative and fun game!!! Thank you, Fede (aka Esklavos).! The puzzles were different, with some interesting twists. And the story was so interesting (those cute bunnies – who knew?!). Best for a while. Thank you again. Очень интересные игры на этом сайте, всегда с нетерпением жду новых игр! Спасибо Ли-ка! (I don’t know if it’s the right word. I wanted to say Thank you). I’ll be working on new games, thank you Janine! I moved the stones around, then it got stuck.